The woodchuck is often seen basking out in the sun or running through your yard. 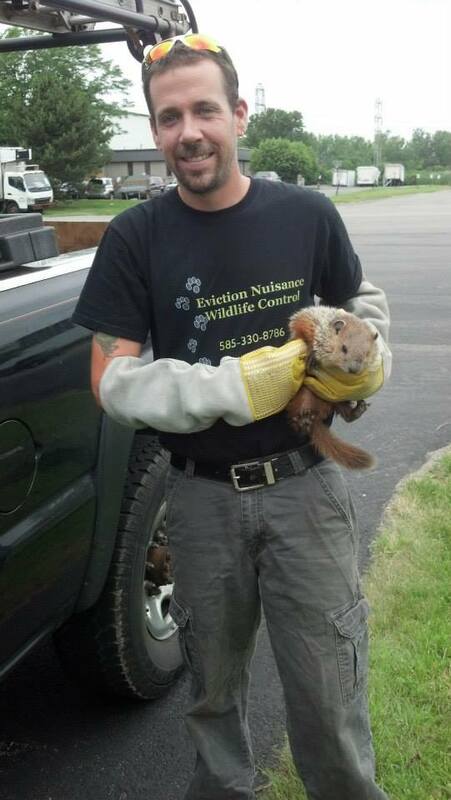 The woodchuck can reach lengths of up to 27″ long which does not include the tail. Woodchucks are herbivores eating grasses, fruits, garden crops, and ornamental. Woodchucks give birth to their young during the end of March-May and have a litter about 3-4 in size. The female will kick the young out near the beginning of July. Woodchucks hibernate, they sleep from the first heavy frost straight through early spring. Woodchucks do not commonly stray more than 50 yards of there den. A typical burrow can be 2-5 feet deep and may be up to 60′ long. There can be up to 5 separate entrances to the den. Woodchuck trapping/removal can be done anytime they are active. However we at Eviction Nuisance Wildlife Control would prefer to wait until July to make sure that any young the animal may have had are no longer present at the site. We can trap and remove the whole family if immediate removal is needed.